2019 Jaguar F-PACE is the perfect performance SUV. Get impressive exhilarating performance paired perfectly with efficiency. 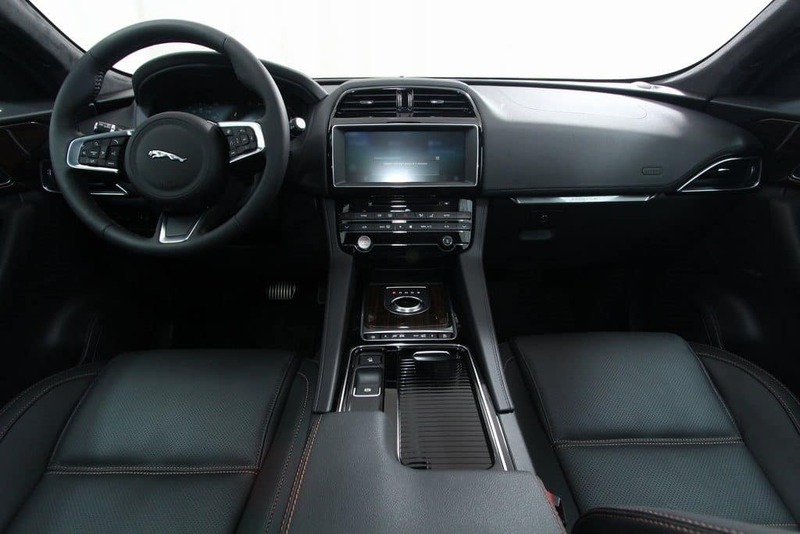 The interior is elegant and sporty with the type of features one would expect from a Jaguar! It is practical and spacious with an emphasis on driver and passenger comfort. The quality craftsmanship with premium materials and sophisticated finishes promises to impress. Choose the optional carbon fiber trim finisher for an extra stunning interior. The optional Configurable Ambient Interior Lighting allows you to choose from 10 color choices for lights. This allows you to create a personalized atmosphere that is welcoming and relaxing. Comfort is a focus of the F-PACE luxury interior. Seating is soft and luxurious with just the right amount of support. Choose the available Performance Seats for a sports car feel. These perforated grain leather seats have adjustable side bolsters to help keep you in place no matter how winding your travels are. The rear seat offers an impressive 37.2 inches of legroom. You can seat three adults comfortably in the rear seat. Add on the available rear seat electric recline for perfect seating comfort at the touch of a button. Flood the cabin with beautiful sunlight thanks to the panoramic glass roof. Don’t worry, it is perfectly tinted to keep out excessive heat. That means you can enjoy the feeling of spaciousness it creates without dealing with an overly warm cabin. Visit Jaguar Colorado Springs today and experience the 2019 Jaguar F-PACE. We have several for you to choose from so you can find the perfect performance SUV for you!